This fall has been drastically different than any other I’ve experienced so far in my life. After graduating from university and a whirlwind four months serving at summer camp, I found myself living alone in a new apartment and working a nine-to-five job. This new season of life has brought me so much joy, and I am thrilled to be in it. But the thing about picking up and moving, about stepping into new places, is that it forces you to drag some skeletons out of the closet and address them. I’ve learned a lot about myself over the past couple of months. Some of it is good, and some of it is uncomfortable. But I’m making the choice to face it head on, because ignoring it has only meant that my life has been significantly harder than it needs to be. 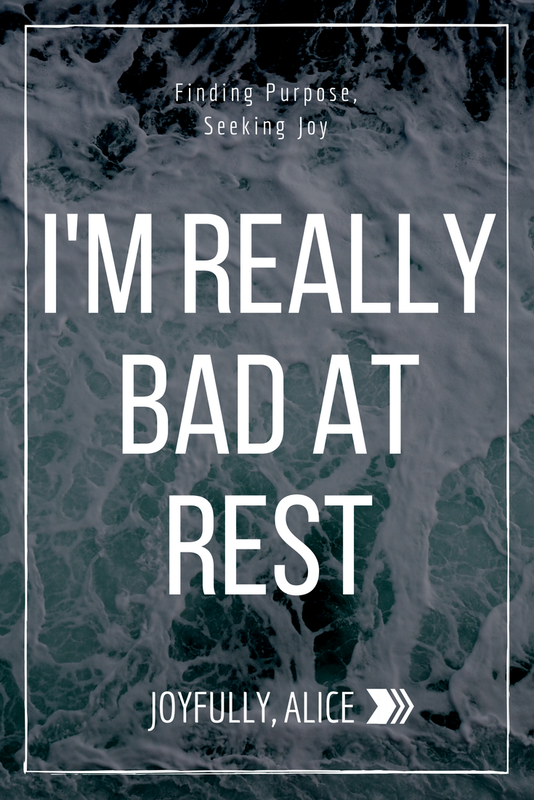 I’m really bad at rest. As in, I don’t know how to do it. As in, I don’t stop until my body physically cannot handle it any longer, and I end up in rough shape. I was talking about this with a friend a couple of weeks ago, and she said this: “As an observer to your life, you’re right. You’re VERY bad at rest.” It’s a well-known fact about my life, apparently, to everyone but me. For most of the past five or so years, I have gone non-stop. When I was not at school, I was working, volunteering, socializing – anything to keep me busy. I felt that downtime was wasted by default, and even I if I was alone, I should be productive. I threw myself fully into every activity I joined, and while it brought me many incredible friendships and memories, it is still possible to have too many good things on the go at once. As the summer began to wind down, I thought and prayed a lot about what my role was supposed to be in ministry, in friendships this fall. To be quite honest, the idea of not being a student terrified me because it was all I’d ever known. School was a safe option, and I knew what to expect there. And without that safety net, I found I wasn’t entirely sure who I was supposed to be. I asked God with increasing franticness what I was supposed to do once camp ended and all the possibilities of the world were at my fingertips. But to my frustration, I heard nothing. I saw God move in phenomenal ways this summer, but where my future was concerned, there was radio silence. I waited, applied for jobs; I got a job. But there was still this massive question mark surrounding what the other 128 hours each week were supposed to look like. It took me far longer than I’d like to admit before I realized this was God’s way of telling me to stop trying so hard. The whisper be still was there all along; I had only missed it with my shouting prayers. Being involved in ministries and community organizations is good and important, but somehow, I never end up being the casual attendee; it’s an all or nothing deal with me. And to address some of the root causes of this in my life, I needed to completely step back for a while. It was well over a month before I even started to unwind. I would come home from work and try to be ‘productive,’ but then feel guilty when I watched a bit of TV and went to bed early without accomplishing anything much. Having evenings off was a completely foreign concept, and despite knowing that I had no concrete responsibilities, the nagging feeling that I was letting someone down remained. It was a bit like I had been trying to sprint a marathon and then been plucked up by a hand in the sky, my legs continuing to flail even though there was nowhere to run. But this is the point of it all. You don’t have to sprint through life, hoping that you’ll accomplish enough to be a good person/friend/Christian. God did not give you this body, this life, so that you could drive yourself into the ground. He wants you to live well. He wants you to rest. And He wants you to do it on His terms. In Psalm 46, God calls out through the writer – “Be still and know that I am God!” Be still. Be. Stop doing so much, and remember who ultimately has control. Resting is not the same as collapsing from exhaustion, whether spiritual, emotional, or physical. Rest is about stewarding the resources of ourselves well, and remembering that we are only able to accomplish good and holy things because God is our strength. Consciously taking time away from being busy resets our priorities. A lack of rest only results in broken bodies and bitter hearts, and it tends to be paired with an attitude that sets the truth of grace aside in favor of a works-based doctrine. It grabbed hold of me, and it was killing me. I don’t write this because I’ve got it all together now. This is very fresh for me, and processing it has been hard. I write this because it’s what God is teaching me right now, and I know that I’m not alone in that. I wish someone had come alongside me and told me sooner that rest is not for the weak, that rest in Christ is the only way we can be strong. So if you also find yourself in a season where you are desperately in need of rest, consider this your permission to stop striving so hard. It’s okay to not say yes to every opportunity that comes your way – it’s healthy, even. You cannot singlehandedly do everything. Your worth is not determined by how many volunteer hours you put in each week. You are precious, and need to take care of yourself. Because if you don’t take care of yourself, you definitely won’t be able to take care of anyone else. That’s the message I’m telling myself every day. I’m not good at balance. But I’m working on it. If you’re struggling to find rest, I’d love to pray for you. Send me a message, and we can chat about it.